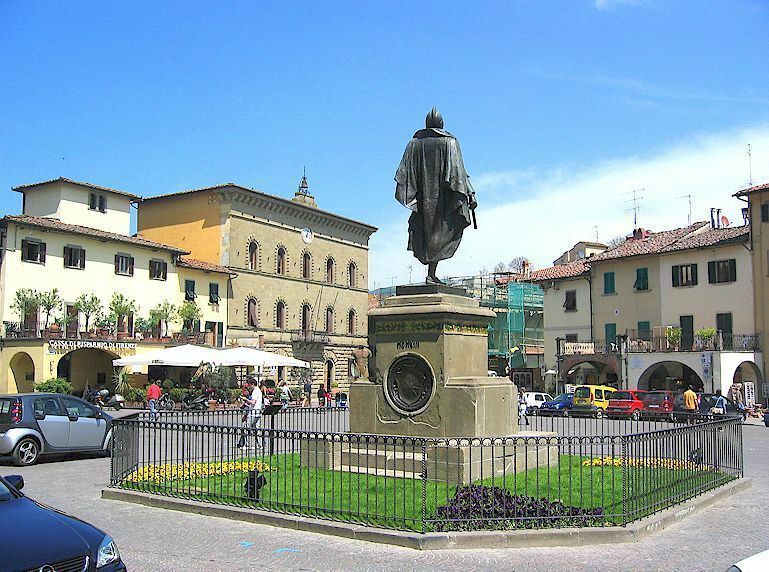 • Greve in Chianti is the market town of the Chianti Classico wine zone and the nearest town of any size to Lamole. The main square is surrounded by attractive arched arcades and a good range of shops selling local food specialities, wine, ceramics, furniture and so on. There is also an excellent Coop supermarket that offers almost everything you need on a day to day basis during your vacation, plus a range of freshly cooked foods. There is a small museum of sacred art just above Greve and an excellent public swimming pool about 1 km towards Florence. There are several restaurants within Greve and many more in the countryside around about. The charming castellated village of Montefioralle, 1.5 km uphill from Greve, should on no account be missed. More about Greve in Chianti. • Panzano in Chianti is smaller than Greve but about the same distance from Lamole. It is worth a brief visit for its church, its mediaeval lanes and the view out over the valley known as the Conca d'Oro. Panzano has several restaurants and wine outlets. 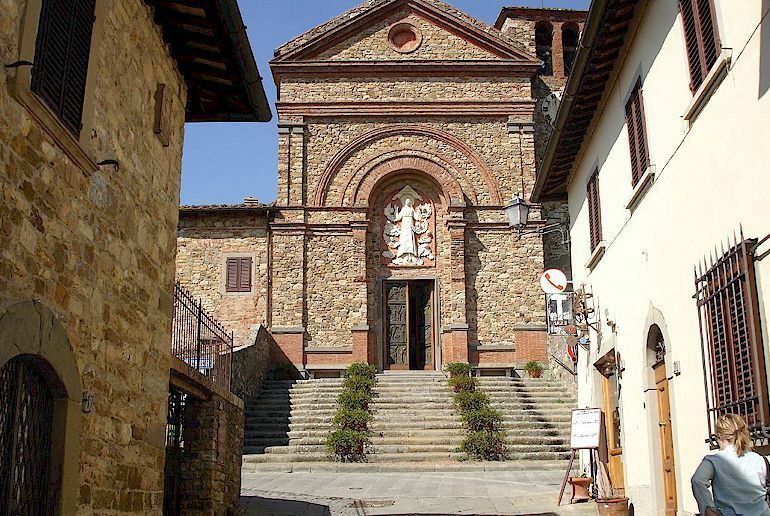 There are two interesting churches neaby, one being the Romanesque Pieve di San Leolino and its small cloister, and the other the Oratory of Sant'Eufrosino, a rare example of Tuscan gothic architecture. There are many vineyards in the area, some of them offering wine tours and wine tastings, and all of them with excellent wine for sale. More about Panzano in Chianti. 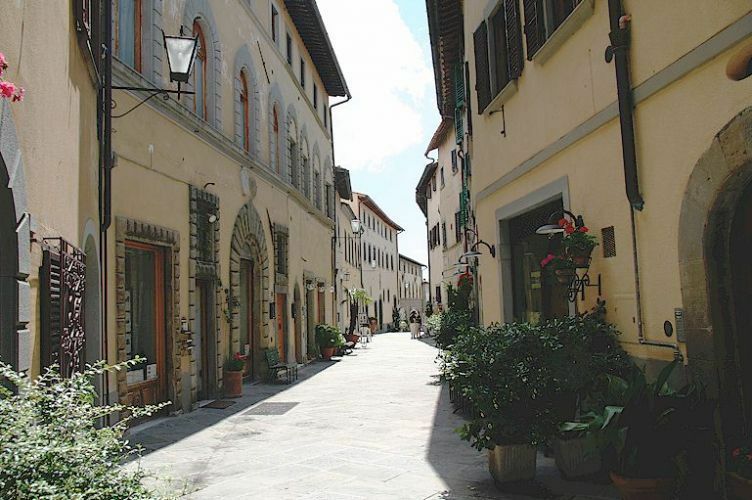 • Castellina in Chianti is a popular town located on the Chiantigiana highway towards Siena. It can easily be visted by car from Lamole. Castellina has a large "rocca" (fortress) and one or two unfortunate industrial structures. Perhaps its most striking feature is the tunnel or covered road that runs alongside the town wall. There are several good restaurants in and near Castellina, as well as shopping possibilities. There is a large Etruscan tomb and a smaller necropolis near Castellina, and a visit to the village of Fonterutoli, on the road to Sienna, is highly recommended. More about Castellina in Chianti. 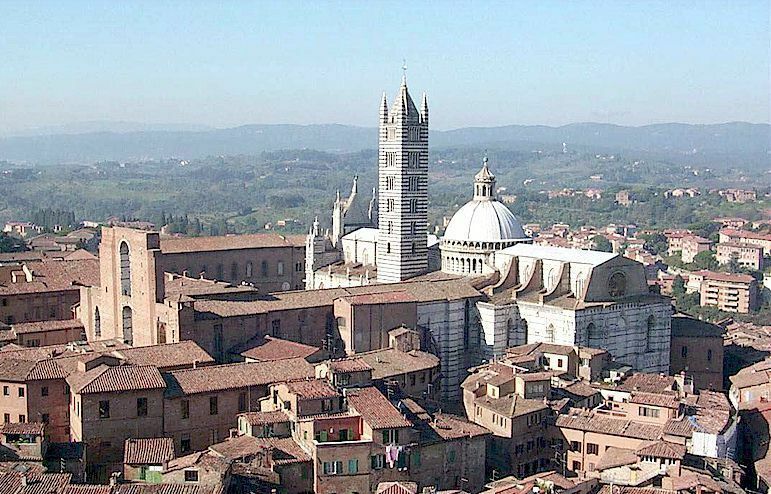 • Sienna was an ancient Etruscan town and in the Middle Ages was the great rival of Florence until its fall in the 16 C. That was the end of a dream but Sienna preserved its glorious memories inside its walls. Walking through its streets, its lanes and squares, you feel an extraordinarily unique atmosphere, which reaches its peak with the Palio, a uniquely Sienese event that should not be missed if you are here when it takes place (twice per year). Siennese cuisine offers specialities of ancient times such as panforte, ricciarelli and cavallucci, while the wines from the surrounding hills match tasty dishes of the best Tuscan tradition. More about Sienna. 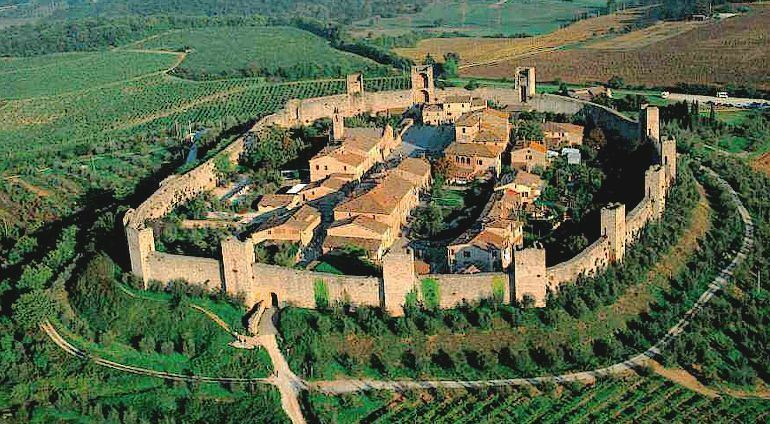 • Monteriggioni is one of the most interesting and intact walled villages in Tuscany. The visual effect from a distance is quite astonishing. Inside there is almost no traffic, making Monteriggioni a great place for children to really enjoy themselves. In addition, the buildings inside the walls of Monteriggioni are original and attractive, and there are a couple of restaurants. More about Monteriggioni.